For myself, one of the most difficult aspects of my grief journey has been accepting the fact that God allowed this to happen. Days before our loss, I was reading in the book of Job. Not by coincidence, I assume, instead God's way of preparing me for what was to come. Two passages struck me. The first is found in Job 2:10, "...Shall we accept good from God, and not trouble? (NIV)" Humbling, yet striking to the core. Creating a myriad of negative emotions as a result of the truth that God allowed this to happen, yet simultaneously humbling me before the Creator of the Universe. The second was Job's response as he was mourning the deaths of his children, he spoke in worship, "...The Lord gave and the Lord has taken away; may the name of the Lord be praised" (Job 1:21, NIV). To acknowledge that "the Lord has taken away" and still trust Him, that's where I struggle. To admit that God allowed this to happen is painful. It makes me feel sad, disappointed, angry, resentful, and betrayed. It's agonizing to accept that He allowed this to happen when I know He could have prevented it if He only would have chosen to. This struggle was exasperated recently when I was challenged to come face to face with the reality that God allowed our miscarriage. I did not want to accept the fact that God allowed this to happen because I was fearful of how it would change my view of God and my relationship with Him. However, as I was reading Grieving the Child I never Knew, the author's words offered no alternative choice when she wrote, "As painful as this truth may be to face, sooner or later, you must" (p. 70). Instantly, her words deeply afflicted a part of me that I had been hiding and burying...the part where I was asking, "Why?" As this part of me was exposed, my whisper became a scream and my insides were screaming "But why?". God did not answer to my question, but He did respond. He gently spoke, "Surrender". Upon hearing His response, I promptly left the kitchen table and headed to the beach, which was only a stroll away from a cabin we were staying at for the weekend. I thought the beach was a good place to think, plus I was overcome with emotions and did not want the other people in the room to notice my tears. While sitting on the beach, I started sharing my honest feelings, fears, struggles, doubts, and pain with God. I told Him I wanted to trust Him and in my head knew He was trustworthy, but admitted this experience had stolen some of my innocence and childlike faith. I told Him that I knew He was bigger and smarter than me, and acknowledged that He was God, not me, and asked for help to accept the fact that I may never receive an answer to my "But why?" question. 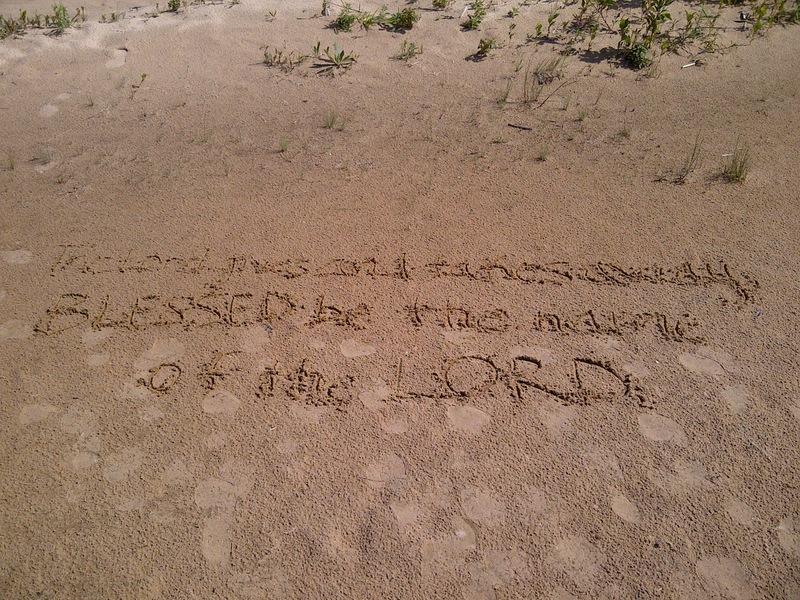 "The Lord gives and takes away; Blessed be the name of the Lord." 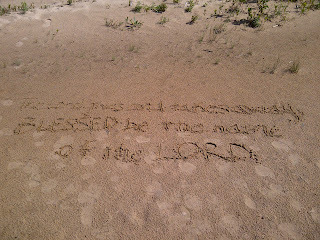 After writing those words in the sand and surrendering in my heart, an indescribable peace and freedom overwhelmed me. A weight was lifted, my burden was lighter, and I was freer.